As smartphone cameras seem to be getting exponentially better, what has become of the camera? There is certainly still a market for high-end DSLR cameras, but the point-and-click digital cameras have almost become extinct. 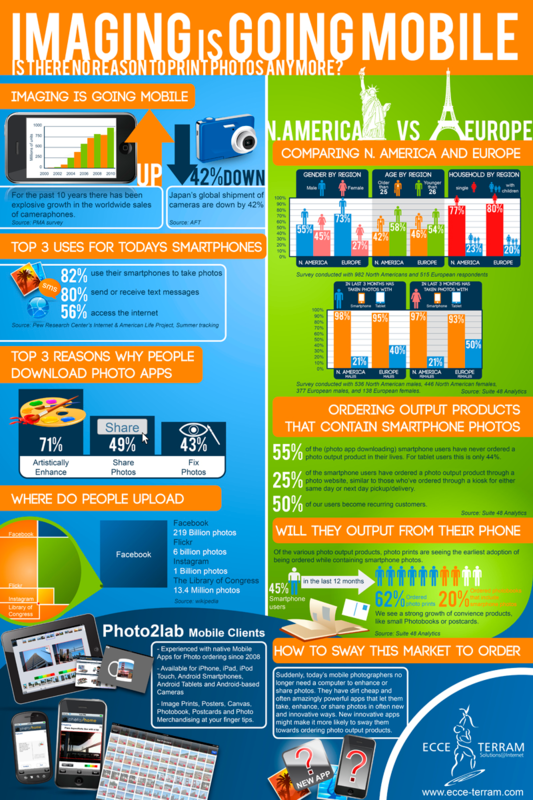 We just came across the below infographic, which really speaks to the rise of smartphone photography, and the decline of traditional photography. The infographic was created by ECCE TERRAM, a provider of software solutions and services for digital photo labs, commercial printers and fulfillment centers. They will be at CES in LVH, booth 42003. The thing about Infographics is that they are supposed to draw you in by appearing interesting and fun. I took one look at this one and it eemed overcrowded and confusing. Since the subject matter is boring and not really relevant to anyone who is a serious photographer I didn’t even attempt to start deciphering the mess. As fas as infographics go, this is an epic fail. Whoever designed it needs to go back to school and learn a few things about graphic arts. There’s no flow. It’s just a mish-mash of text, bar graphs, and unnecessary and badly positioned clip-art.